New York Brunch Tri-Borough Brunch adventures. During this trip we did two brunches in Brooklyn, one in Manhattan and one in Astoria, Queens. As we have friends living all over the city, we covered lots of ground in our quest to make sure we got to see as many people as possible and after many failed attempts we finally got to meet an old and very dear friend in Astoria. In each of the brunch adventures we went on, they were very unique. The food was spectacular as we have come to expect in this fine city and the menus were as varied as our friends were. So this made for a successful weekend in the city that never sleeps. Lets start from the beginning, or at least Saturday morning, when my friend heard I was staying in the East Village, they told me we had to go to Veselka which is traditional Ukranian dinner. There were 2 main factors that made Veselka a great idea. First that I had never had a Ukranian brunch and second, it was within walking distance from where I was staying. The menu was interesting and unlike any other brunch menu I had seen before. With a sign boasting New Yorks City’s best Pierogies, I had to try a pierogi dish and when I saw a breakfast lox Pierogi I had to order it. 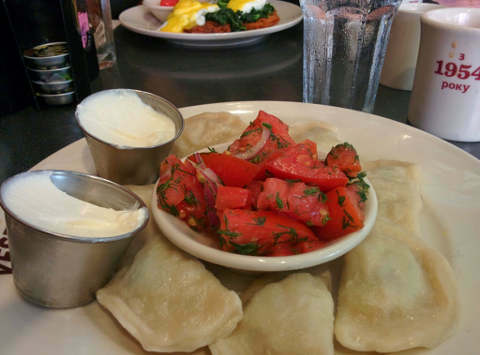 I have never had breakfast pierogies, in fact I didn’t know such a thing existed. The pierogies were boiled and the smoked salmon and cream cheese worked well for something you would expect for a dinner dish. 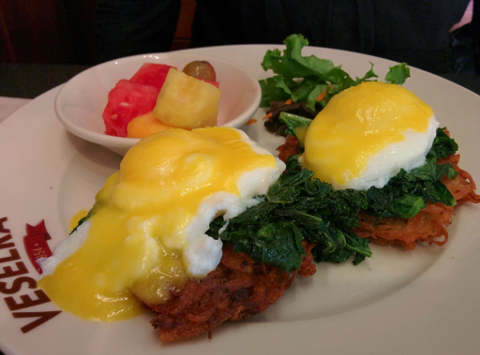 My friend had the Kale Benedict which was two poached eggs on top of kale sitting on a potato pancake. I loved how this dish marries traditional items like potato pancakes and more recent culinary trends like the use of kale. After Veselka I made it to Iris over in Brooklyn, this was the later morning / early afternoon group, pretty much the people I was partying with Friday night. I had been to Iris before and liked it, the food was good, the vibe was very chill. This time we waited for one of our friends who was missing in action from the previous nights adventures. This brunch was different from others because it was a birthday brunch with an aspect of day drinking and absolute joy. I use the word joy because the birthday girl always brings sunshine wherever she goes and the people present were all happy and excited to see each other. 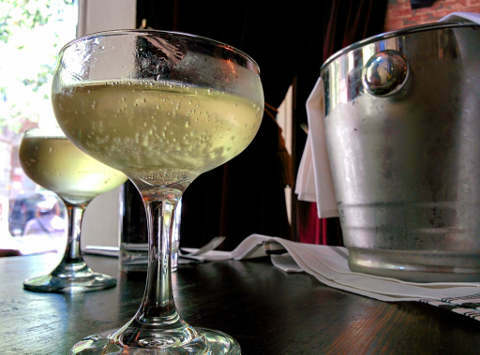 So we started with a bottle of Cava to set the mood and make it clear that today was a day drinking kind of day. So on we went to our second bottle, oh an in between we sampled some of the menu items like an impressive shakshuka that was not there last time I went and is one of the better ones I have had to date, this was an unexpected treat. 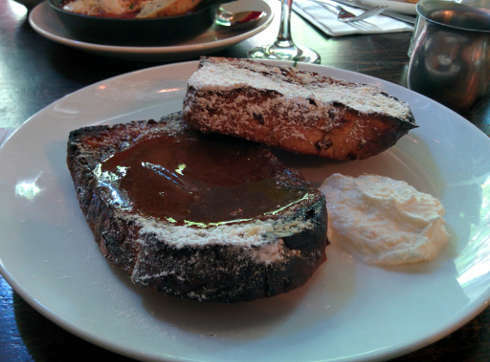 The French toast was also surprising with its hazelnut spread and sweetness, the bread had a little crunch so it worked well by not being too mushy from the hazelnut spread and a side of their house ricotta. My first time at Iris was around 2 years ago, I had brunch there twice in the same day. The first time was on a dog walk and a to go snack (so doesn’t really count) and the second time was a gentleman’s brunch (we will discuss this another time). On this trip to Iris, I noticed an evolution in the menu. They took risks and they it paid off. They have brought their menu to a place that complements the ambiance and feeling you get when you sit down. With our bellies full of food we went on with the day and onto the nights shenanigans. We managed to wake up in the morning, and make it back to Brooklyn and try out a Mexican brunch by the name of Alma. 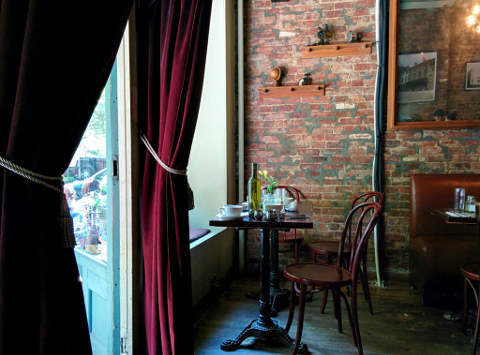 Combining ethnic food and brunch can sometimes be tricky but New York is the city that can do it. 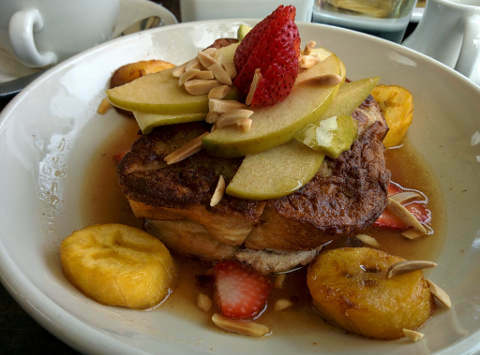 The pan Mexicana is two thick slices of French toast filled with fresh queso, plantains and topped with sautéed apples and almonds. They were even able to modify the dish by separating some of the ingredients for the little kid we had with one and the big kid among us went hog wild on this dish. This dish looked good and tasted just as good as it looked, with that nice touch of sweetness and a proper thick slice for the French toast. Next up was the chorizo enchilada which had chorizo, scrambled eggs, topped with pumpkin seed sauce, queso and pico de gallo. This was a traditional dish with touch of scrambled eggs to make it a brunch dish. So after brunch #1 and some catching up (as well as seeing the cutest kid in Brooklyn), it was off to Astoria, Queens. Truth be told I have never been to Queens, and I discovered Astoria is where the subway line ends. Now I have been trying to catch up with this friend for well over 5 years and every time I came to New York something stopped this reunion from happening although this time success was at hand since we were soon sitting down at MP Taverna and sharing brunch and years of experiences. Now if you are not familiar with Astoria it has a large Greek community and it has some serious history and charm to it. 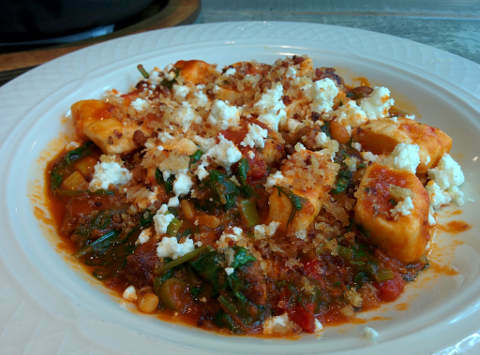 Now I have never had a Greek inspired brunch. In fact I suspect it was like the Italian brunch in that did not really exist other than in tiny little breakfast places and more focus on lunch and dinner. 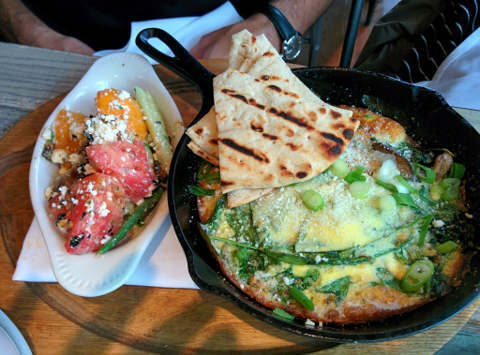 MP Taverna takes the classic New York brunch and adds a Greek flavour to it. 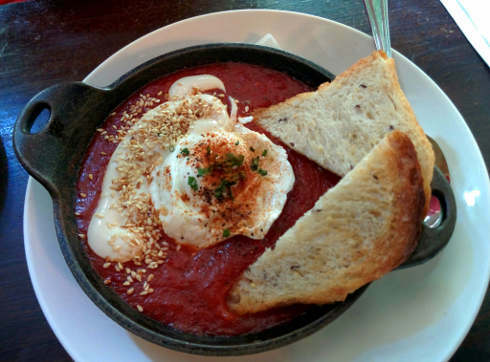 Dishes like the egg souvlaki and the cast iron breakfast are two examples where items like pita bread, feta cheese and Greek sausage are used to give the brunch dishes that Greek inspiration. Other dishes like dumplings and the salmon dish showcase some fancy touches one would not come to expect from an ethnic area and show the constantly dynamic changing face of these communities. So having caught up with almost all of our friends, shared a good meal and partied a little this was a good weekend. I can safely say that this is it for my 2014 NYC trips, unless of course another impromptu party request is sent, but barring that, see you in 2015 NYC.